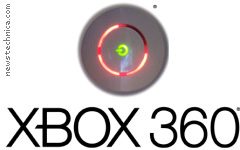 Made from Microsoft Press Pack XBox 360 logo and Xbox360-ringofdeath.jpg (created by English Wikipedia user Droobey and placed in the public domain). The poster asserts that the use of Microsoft’s Xbox logo is fair use under US law for purposes of political and satirical commentary. yes i was wondering if u had a poster of this or know where i can get one thanks. please email me. @tiff – hah! I’d love to, but I think Microsoft would sue my backside into oblivion … there’s fair use for political and satirical commentary, and then there’s pushing it.